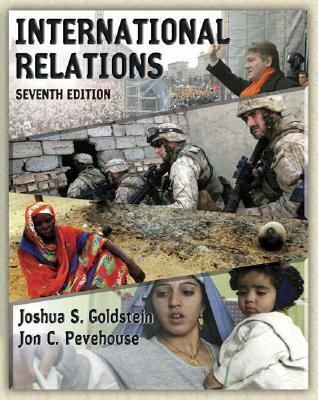 by Goldstein, Joshua S., Pevehouse, Jon C.
Goldstein, Joshua S., Pevehouse, Jon C.
Top-selling text in its field, International Relations, provides unparalleled coverage of international political economy, traditional and alternative theoretical perspectives, technology, and contemporary global events. Completely updated. Expanded and updated coverage of the ongoing war in Iraq, nuclear proliferation in North Korea and Iran; the new Palestinian leadership; Islamic radicalism; global anti-Americanism; the expanded EU and NATO; and world trade talks. Expanded discussion of constructivism. New "Policy Perspectives" is a one-page feature puts students in the shoes of top policy makers for example, Russian President Putin -- making foreign-policy choices in response to a problem or challenge. The box includes an inset photo of the policy maker. The feature engages students to apply IR concepts in real-world situations, and underscores the role of individuals in the foreign-policy process. NEW! TECHNOLOGY ADVANTAGE MyPoliSciLab for International Relations.Goldstein, Joshua S. is the author of 'International Relations-with Mypoliscilab ', published 2005 under ISBN 9780321424839 and ISBN 0321424832. Loading marketplace prices 37 copies from $1.74 How does the rental process work?